Cleanly processed raw honey is in demand all over the continent! Honey of this sort will never lack buyers. The goal of AfricanBeekeeping.com is to train African beekeepers. Training is done in either English or Swahili. We are proficient in both languages. We have trained beekeepers in Tanzania and Kenya. Training seminars have been held in Mbeya, Iringa, Sumbawanga, Rukwa Valley, Ufipa Plateau, Nairobi, Kijabe, and Maasai-land. We primarily work with the widespread Apis Mellifera Scutellata bees, however these techniques work well with any African bee species. This website is designed to help those in Africa connected to the internet who are looking for a simple, straightforward guide to keeping and caring for African bees. If we can help you in any way please communicate with us through the "contact us" page on this website. Some of our 2017 trainees getting ready for their Practical training. Harvesting honey! Working with our November 2015 trainees at our beekeeper training station. 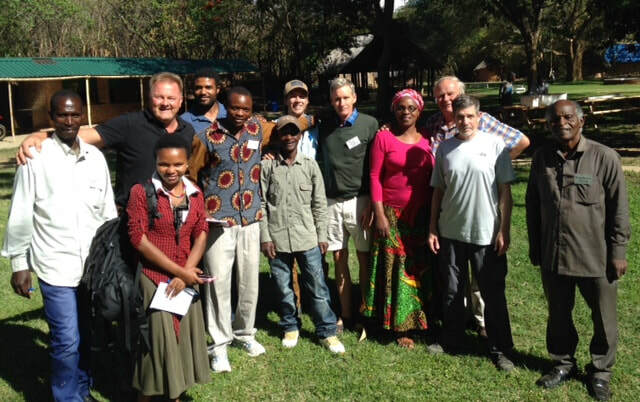 These are beekeepers who have come for our "one-day" training session held at Masumbo camp outside Iringa. This "short course" is ideal for those interested in beekeeping but not desiring to attend our five-day course. The people pictured here have come from Iringa and Rukwa region. If you have questions regarding our courses feel free to reach us through our "Contact Page."